This map indicates properties that will be impacted by this industrial wind turbine (IWT). 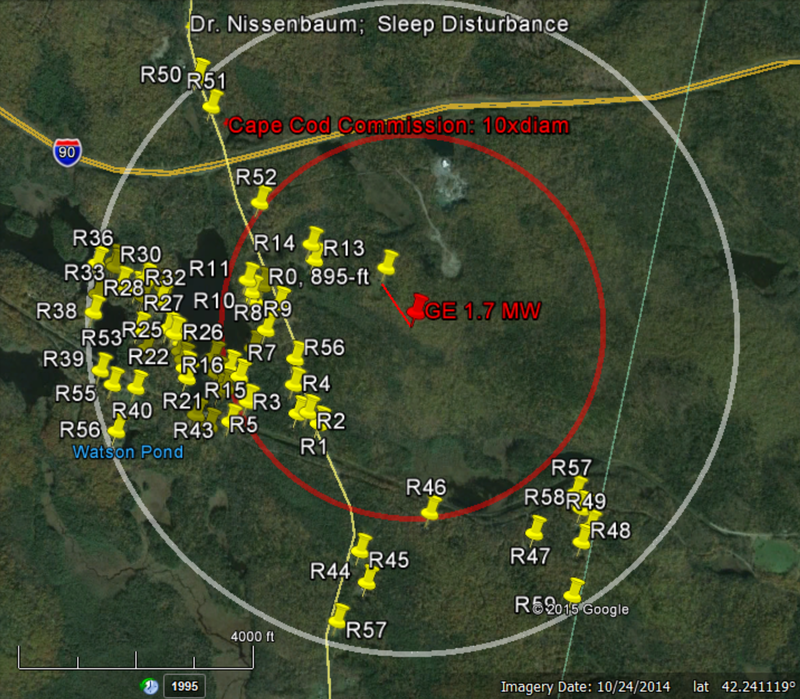 Concentric circles here indicate the location of the turbine and the potential wind neighbors. The town must vote again on September 8th for the Proposition 2 1/2 override needed for the project to go ahead. There have been over 50 projects that have not moved forward in Massachusetts since 2004. This is due to greater public awareness of the simple facts that individuals living near the turbines have seen their property values plummet and noise from these 40 story high structures has caused serious health issues. Those selling the turbines don’t talk about the health risks. They don’t talk about how much they cost to repair when they break down. They don’t mention that they don’t produce any energy when the wind is not blowing. They conveniently forget to point to towns such as Princeton and Falmouth MA. In 2009, after weathering several years of controversy and lawsuits, the Princeton Municipal Light Department built two wind turbines with promises of significant savings to its electricity ratepayers. It promised that in the first year of operation it would see a net benefit of more than $800,000. Instead, from January 1, 2010 through June 20, 2012, the two-turbine wind power plant in Princeton lost $1.875 million. According to the Falmouth Town Manger, the wind energy receipts no longer ﬁnancially support the maintenance of wind turbines at the wastewater treatment plant because of their shortened hours of operation. A revenue decrease of $250,000 to $280,000 revenue is expected in FY 2015. The turbines are running at less than half capacity after a Barnstable County judge in 2013 ordered the town’s two wind turbines to be shut down for 12 hours a day and completely off on Sundays. Of the over 50 projects not going forward, the largest factor has been community concerns about noise followed by stark realization that the turbine project would not be economically feasible. Single turbines often become obsolete making repairs unaffordable. I am surprised a community would fall for this with the barrage of information available. Looks like residents did not do their homework on this one. The Department of Energy claims wind power has dropped in price to around $1,700/kw yet this project will cost a whopping $3764/kw. Also, the town is anticipating a 40% capacity factor. That is highly ambitious, especially if it will be owned/operated by the town. Finally, with energy costs at low levels and MA having met its RPS for 2014 and 2015, it’s unlikely the turbine will raise the kind of revenue claimed. Hopefully folks are paying attention.